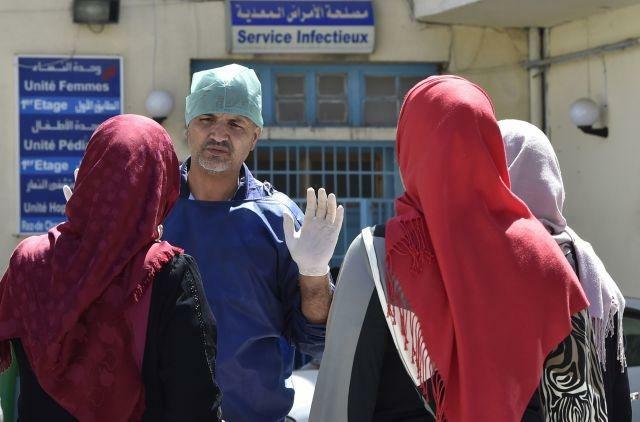 Outside a hospital in Algeria, worried relatives arrive daily in a desperate bid to talk to those quarantined inside -- the victims of the country's first cholera outbreak in more than 20 years. Cases began appearing in early August and two people have so far died, with scores hospitalised in Boufarik, about 20 kilometres (12 miles) south of Algiers. Said, whose mother has been quarantined for 10 days, told AFP he is "tired and demoralised". "I want to visit my mother. But they do not allow me access", he said. Only suspected cholera admissions, confirmed cases and staff are allowed into Boufarik hospital's infectious diseases department, where 91 people have been quarantined. For others, access is "formally forbidden", said manager Reda Daghbouche. Standing a metre (yard) or so in front of an open window with blue shutters, three women covered their mouths with veils or handkerchiefs, as they exchanged a few words with a relative. And truck driver Fatah spoke through the bars of a locked door to his mother -- one of 59 confirmed cases. "Thank God, she is now on her two feet -- when we brought her to the hospital she was in a serious condition, we thought we'd lose her", he said. Fatah has visited his mother every day for 12 days and "hopes for her release very soon". Patients arriving at the hospital with acute watery diarrhoea and vomiting -- key cholera symptoms -- are immediately placed in isolation. "Analysis takes from three to seven days", said Daghbouche. He told AFP he has been cured of cholera, after eight days in hospital. A grocer told AFP he wears medical gloves in case "the banknotes are contaminated". Meanwhile, watermelons -- allegedly the origin of the outbreak, since they absorb large quantities of untreated water -- won't sell for any price. He kissed the security guards who had stopped him from entering the wing. The released patients ran to their relatives' cars, desperate to leave. Those who remain in quarantine are like "prisoners waiting to be pardoned", said Fatah, disappointed that his mother remains inside.